Introducing the police siren that will change the way your fleet is heard. The Carson Sirens, SC-411-RD is the most advanced police & fire siren that we have ever introduced. 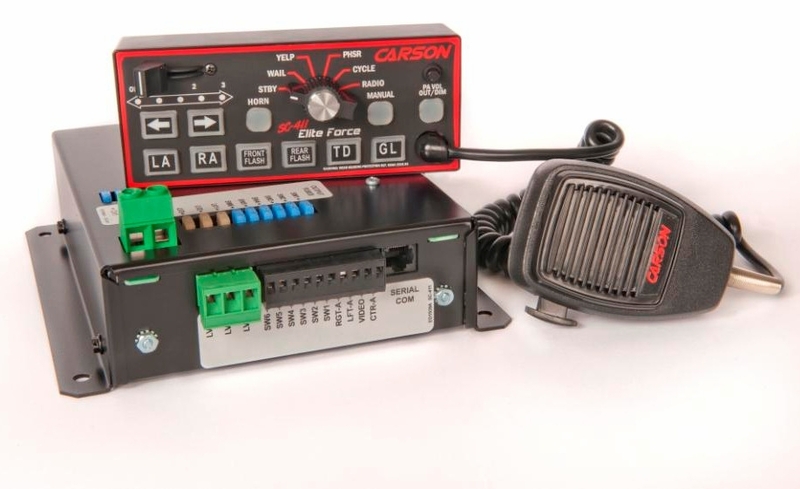 It features a very advanced yet easy to use QuickClone duplication technology that allows you to program one siren and copy that configuration to all other sirens in your fleet. Plus, with DUAL TONE functionality, you can power two siren speakers with different tones. 200 watt functionality assures that it's LOUD too! Ok let's get down to the nuts and bolts of this siren. It was developed for smaller spaces but to have the same functions as the full console unit. The new remote Elite Force siren series introduces the new QuickClone duplication technology making it easy to transfer option settings from one unit to another without the need for an external computer, ideal for fleet installations. The splash resistant rubberized control head face offers programmable siren tones, light and arrow stick controls and our patented video trigger capability. The SC-411-RD has DUAL TONE! Ever thought of what it would sound like to have two of your police sirens or fire sirens going at the same time? The Elite Force allows you to do just that. with two distinct tones being produced at the same time, it really captures your attention. The siren may produce Dual Wail, Dual Yelp, Dual Phaser, Dual Air Horn and combine Wail and Yelp at the same time. These tone pairs are programmable for each siren switch position. Have a video system? Our patented video trigger output allows a dedicated line to a video system signal to it that it begin recording. To do this move the lever switch or the auxiliary switch to on and your video system will begin to record. activated. This provides complete control to insure that the video system is prompted to record with activating a combination of any specified light output as well as any switch programmed as a gunlock timer. QuickClone - setting duplication technology – Options are automatically synchronized between the control head and amplifier, allowing easy copy from vehicle to vehicle without the use of an external computer for simplified fleet installations. Face Diagnostic Indicators: ->Each light and siren output is individually protected with externally exposed fuses and have independent diagnostic sensors at the connectors that display the status of each output on the face of the unit. Audible and visual alerts are transmitted when the sensor detects an output that is not functioning properly. Adjustable Backlighting - with the press of a button the user can tailor the brightness to their personal preference. Splash Resistant Rubberized Face -The unit incorporates built in auxiliary and siren switches with backlighting and flanges to seal around the lever switch actuators and volume control knob for improved protection for the internal circuitry from common accidental spills.